COLOGNE, Germany — Nicklas Backstrom and Oliver Ekman-Larsson scored in the shootout for Sweden as it beat Canada 2-1 on Sunday to capture gold at the world hockey championship. Victor Hedman scored late in the second period shorthanded to give the Swedes a 1-0 lead. Henrik Lundqvist picked up the win in net with 42 saves. Ryan O’Reilly tied the game at 1-1 with a power-play goal early in the third. Calvin Pickard stopped 40 shots and took the loss. The win is Sweden’s first in four tries against Canada since the IIHF instituted the playoff system in 1992, and their first since 2013. 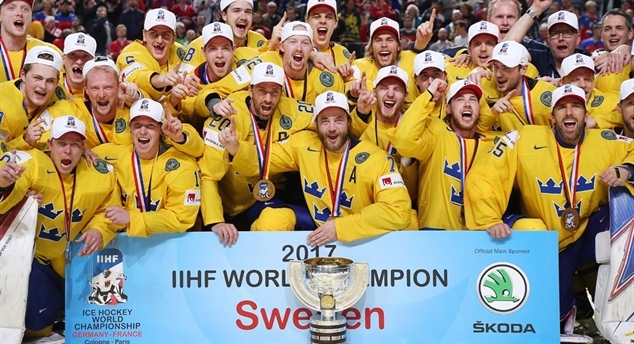 Sweden stops Canada from being the first team to three-peat since the Czechs accomplished the feat between 1999 and 2001. Just like in Saturday’s 4-2 semifinal comeback win over Russia, there was no scoring in the first period. After competing in separate groups in the preliminary round, the Swedes and Canadians went through a feeling-out process. Shots were 12-10 for Sweden in the first, with Canada easily able to kill off two penalties against the ninth-ranked Swedish power play. Hedman got Sweden on the scoreboard with Nicklas Backstrom serving his second penalty of the game. Hedman’s bouncing shot from the point off a broken play eluded Pickard with 20.8 seconds left in the period. The Canadians once again used their lethal power play to get back into the game in the third with Elias Lindholm whistled for high sticking at 1:48. It took just 10 seconds for O’Reilly to tie the game at 1-1 by flipping a Mitch Marner rebound over the right shoulder of Lundqvist. It was the first special-teams goal that Lundqvist had surrendered in five tournament games. Canada tested its tournament-best penalty kill when Mike Matheson took a tripping penalty with 3:18 to play in the third period, but the Swedes matched them with an untimely too-many-men penalty with 1:24 left on the clock. Sweden had a slight territorial edge in overtime by outshooting Canada 11-10. Sean Couturier was whistled for tripping with 10:51 left in overtime but the Canadian penalty killers were up to the task. Alex Killorn fed Matt Duchene with a nifty spin-o-rama pass late in overtime, but his shot was stopped by Lundqvist. Sweden called a timeout to set up an offensive-zone faceoff with 21 seconds left to play in overtime. Claude Giroux won the crucial draw to allow the Canadians to get the puck out of danger and set up the shootout. In the shootout, William Nylander was denied by Pickard, then Nathan MacKinnon couldn’t slip his shot through Lundqvist’s five-hole. Backstrom, Sweden’s second shooter, beat Pickard low to the stick side before Brayden Point’s attempt was snagged by Lundqvist’s glove. Oliver Ekman-Larsson caught Pickard moving to put Sweden up 2-0, then Ryan O’Reilly was denied by Lundqvist. Pickard kept Canada alive by stopping his Colorado Avalanche teammate Gabriel Landeskog before Lundqvist stopped Marner to secure the gold for Sweden. William Nylander capped his first appearance at the World Championship with both a gold medal and MVP honors. The young forward led his country in scoring with 14 points in 10 games, and his seven goals tied for first among all players. 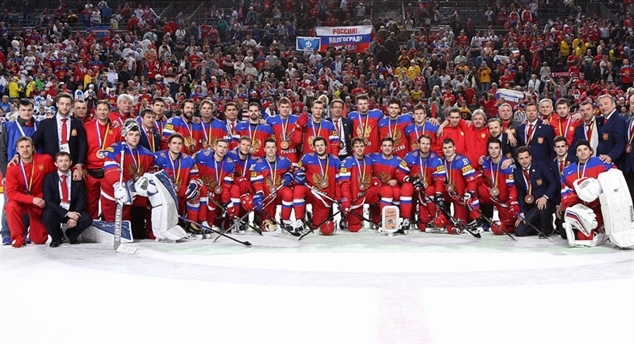 The Russians proved to be too much for Finland on Sunday at the World Championship in Cologne, Germany, as the Red Machine pulled out a 5-3 victory to earn the bronze medal. Nikita Gusev continued his hot streak with two goals and an assist, Valeri Nichushkin added three helpers, and Andrei Vasilevski made 26 saves in the win. Despite scoring three goals, the Finns were never really in the game and have the Russian’s sloppy play to thank for the trio of tallies. Mikko Rantanen had a goal and an assist and 19-year-old Sebastian Aho chipped in with two apples in the losing cause. Russia broke out to a formidable 4-0 lead – chasing Finland goalie Joonas Korpisalo from his net – before allowing the Finns to score three unanswered goals. The comeback effort would be for naught, however, as Nikita Kucherov sealed the victory with just under 12 minutes to play with his seventh goal of the tournament. Finland fails to medal for the fifth time in eight years, while the Russians earned some hardware for the fourth consecutive tournament. The event, hosted by international hockey broadcaster Gord Miller, inducted eight members whose contributions to the sport have helped transform the game as they have served as hockey ambassadors for their respective countries. 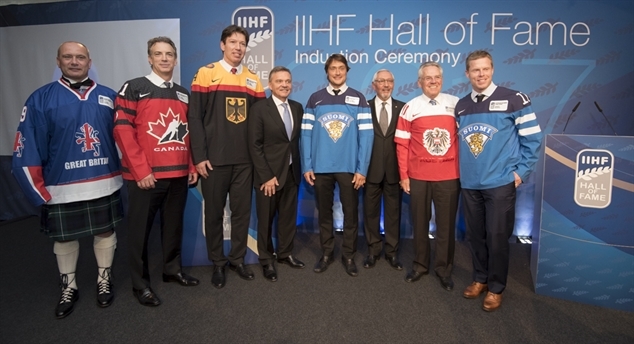 The IIHF Hall of Fame opened in 1997 to celebrate a century of the game being played. Inductees have included some of the biggest names and international contributors to the sport. Saku Koivu won eight medals on the international stage, including leading Finland to its first ever World Championship gold in 1995. Koivu would play for the Montreal Canadiens and, later, the Anaheim Ducks. He would become the first European captain of the Canadiens. Koivu is also known for his courage off the ice. He battled Non-Hodgkin’s lymphoma that kept him out for almost an entire season, including the 2002 Olympics. “It seems like I’ve come full circle coming back to Germany and being honoured for my career,” Koivu said, reflecting that he made his senior men’s debut with the Finnish national team at the 1993 World Championship in Germany. Angela Ruggiero was a world-class defenceman and competitor for Team USA. Her contributions in hockey continue to this day as she continues to break down barriers. She earned four Women’s World Championship gold medals and gold at the 1998 Olympics. In 2015, Ruggiero was inducted into the Hockey Hall of Fame. Ruggiero could not make the event when her father Bill passed away suddenly but her brother Billy was on hand to accept the honour and pay tribute to his sister. Dieter Kalt was a star player in the 1960s in the Austrian league and has been the face of Austrian hockey for half a century. He represented Austrian at the 1962 World Championships in Colorado Springs and in every major IIHF event from 1962-1972. After retirement, Kalt was a referee and coach and then President of the Austrian Ice Hockey Federation from 1996-2016. Joe Sakic had an illustrious career with the Quebec Nordiques and then the Colorado Avalanche when the team moved to the United States. He captained the Avalanche for 17 years making him one of the longest serving captains in NHL history. Sakic is also the NHL’s all-time leader in playoff overtime goals. Winning World Championship and Olympic gold, along with the Stanley Cup, Sakic is a member of the prestigious triple gold club. The Richard “Bibi” Torriani award was presented to Tony Hand, the greatest player in Great Britain’s modern hockey history. The Edmonton Oilers selected Hand 252nd overall in the 1986 draft, the first British player ever taken. When Hand attended training camp, Edmonton general manager Glen Sather announced that the Scottish Wayne Gretzky would try out for the team, which some might have led to think that a player who trained and played in Great Britain would be a curiosity. Hailing from Edinburgh, Scotland, Hand played professional hockey in the BHL as a 14-year-old and finally in the English Premier Ice Hockey League at the age of 47. The Paul Loicq award was presented Patrick Francheterre. Francheterre has been involved with French hockey for the better part of half a century. As a pivotal builder of French hockey, Francheterre has overseen the development of the sport and his country’s ascension into the top division of the World Championships. Teemu Selanne said today’s honour means so much because as a boy, his hope was to play in the top league in Finland and, maybe if things went well, the national team. The NHL was not a thought at the time. Selanne, known as the Finnish Flash, scored 684 goals in 21 NHL seasons and won the Stanley Cup in 2007 and silver medals at the World Championships in 1999 and Olympics in 2006. Finally, Cologne’s own Uwe Krupp gave an emotional presentation about receiving this honour in his hometown. First noticed by Scotty Bowman, Krupp was drafted by the Buffalo Sabres and would go on to an NHL career that spanned 14 seasons with honours that included being the first German to score a Cup-winning goal and the first German player to win the Stanley Cup. He spoke fondly of Franz Reindl and how he was an important person in his career and the next step in his career that has included coaching the German junior and senior teams.